"Any Given Sundance" is the eighteenth episode of Season 19. It originally aired on May 4, 2008. It guest starred Jim Jarmusch and John C. Reilly as themselves. "Lisa makes a documentary about her family for a school project. After the success of her project, Principal Skinner and Superintendent Chalmers encourage her to enter the film into the Sundance Film Festival. But when Lisa's film premieres at Sundance, Homer, Marge and Bart are embarrassed by the candid behind-the-scenes look at their lives"
The family heads to Springfield Stadium for the big game between Springfield U. and Springfield A&M. Homer says the family isn't going for the game, but for the only thing that makes sports tolerable - the tailgate party. As Homer so eloquently put it, "Since the dawn of parking lots, man has sought to stuff his guts with food and alcohol in anticipation of watching others exercise." Homer is the only one excited about the festivities. Meanwhile, Ralph has made himself a Ralphwich, stuffing his hand between two buns. He takes a bite and says "this tastes hurty." Homer brought everything the family needed for the tailgate party - eating utensils and plates. Bart said he didn't want to beg for food, but Homer said that if you know who you're begging from, it's just mooching and goes up to Moleman at the grill and gives him a hug - enough time for Bart to steal the meat off of the grill. Carl and Sideshow Mel start a fight that engulfs the whole parking lot. Marge says that just because Lisa's a girl doesn't mean she can't join in on the festivities - which for them meant washing the giant foam fingers. Lisa opted to begin work on her school video project and took out her camera ("My Little Sony.") She was assigned to film the beauty of the everyday so she captured sights around the parking lot - Carl and Mel making up, a stained glass church window which turns out to be a tattoo on a passed out lady's back, Homer stealing food, a turtle and Barney on their backs. Lisa's inspired and feels like she's a born filmmaker. Lisa turns her project in and gets a 3 out of 5 from the teacher. Lisa goes to Principal Skinner to plead her case for a better grade. He agreed and confessed that cinema was his secret passion. He's even written some screenplays of his own - "When Edna Met Seymour", "Ghost Willie", "Killing Seymour's Mother" and "The Principal Who Sold a Screenplay." Sadly, he's been rejected by the film community and is no longer allowed on the Universal Studios Tour - in Orlando. Skinner says she should find the drama in her life, and Lisa says it's within her family. Skinner suggests she make a documentary about her family to up her grade and gives her the key to the A/V cage. All he wants in return is an Oscar - if she ever wins one. Lisa begins work on her documentary, filming the family having breakfast. Lisa tells everyone to just be themselves and forces Homer to remove his toupee. He said he was going for a "Shia LeBeouf thing." Homer starts smooching on Marge, which grosses Bart out. Lisa captures all of the goings-on in the Simpson house, Marge folding the same shirt over and over because she's focused on the TV, Bart kissing and then punching his teddy bear, the pets in a tug of war with Maggie, Homer passed out on the lawn. Superintendent Chalmers comes to the school and is glad to hear that Skinner is encouraging Lisa in her filmmaking. He wants to show up the Springfield Creative Arts Academy and thinks Lisa's film could do just that. Skinner suggests showing the film at the library, but Chalmers is thinking bigger - film festival bigger. Sundance bigger. If Lisa's film is a hit, the school won't be known only for having the highest hamster mortality rate. They'll also "have a kid who did a thing." The band adds a score to Lisa's film and the bullies become Foley artists, "awesoming up the sound effects" by punching Martin to sweeten the sound of Marge pounding on the bottom of a ketchup bottle. Meanwhile, the Sundance organizers are having trouble finding films for the festival. They've got a film with Paul Giamatti as the world's greatest super spy who exists only in the mind of an overweight, agoraphobic jazz musician - played by Martin Lawrence in a fat suit. Lisa's film is a shoo-in, since she's a vegetarian and an intellectual misfit, causing all the organizers except one to faint (or die). "Capturing the Simpsons" is in at Sundance. Lisa's excited that she's going to a film festival. Homer is too - taking the word "film festival" literally and picturing strips of celluloid dancing in sombreros to Mexican music and their party being broken up by DVDs. The family arrives in Utah for the festival ("Where Parker Posey Meets Parka-ed Posers") Homer's hoping to meet director Jim Jarmusch and "ask him who he is." He finds Jim and the director says his films are meant to tell who he is. He can also eat a raw onion without crying. He takes a bite and immediately starts to cry, which he tells Homer is "about something else. This is the last time we'll ever be together." Homer says "Awww" and they embrace. Marge can't seem to find a movie to watch - "Regularsville" features a cross-dresser and "Candyland" was about heroin addicts. Marge assumed all of the movie titles "mean the opposite of what they mean" and assumes she'll love "Chernobyl Graveyard". She didn't. It's finally time for Lisa's big premier. Homer can't wait to see it, until he realizes it's a documentary. Skinner and Superintendent Chalmers don't have passes and try to get Bart to vouch for them. Of course, he tells the usher that he's never seen them before in his life. They get put on a sled and careen into a Mormon chapel - and come out with a bunch of brides - one of whom tells them that this is all a figment of their imagination and that they actually crashed and are passed out in the snow. The film, produced by "Chalmskinn Productions" begins. Lisa shows her family in all of its dysfunction, including Homer blowing up during a game of Chutes and Ladders. An audience member notes "what a wonderful film about horrible people." Another scene features Bart breaking dishes and Homer walking in with bare feet. Marge cleans up after them and Lisa wishes her a "Happy Birthday." The end. The film gets a standing ovation. Marge asked Lisa how she could do such a thing to them. Marge said lots of things got changed in the editing room - unfortunately, right after that a full-screen credit popped up that said the film was "proudly edited" by Lisa. Whoops. Obviously, everyone's mad at Lisa. Bart said, "I knew you were lame, but I never imagined you were bogus." Marge said she was usually a supporter of her but her film humiliated the family in front of the whole world. Lisa said she was just trying to capture her "unique and quirky" home life. Homer said "quirky" was an old lady giving someone the finger and said she made the family look like monsters. Lisa said no one was going to see or hear about the film outside of the festival. Wrong - Comic Book Guy was already posting a glowing review on his blog, "Ain't I Fat News." Outside Woody Allen and Soon-Yi were squabbling. Apparently he was thinking of adopting Scarlett Johannson. 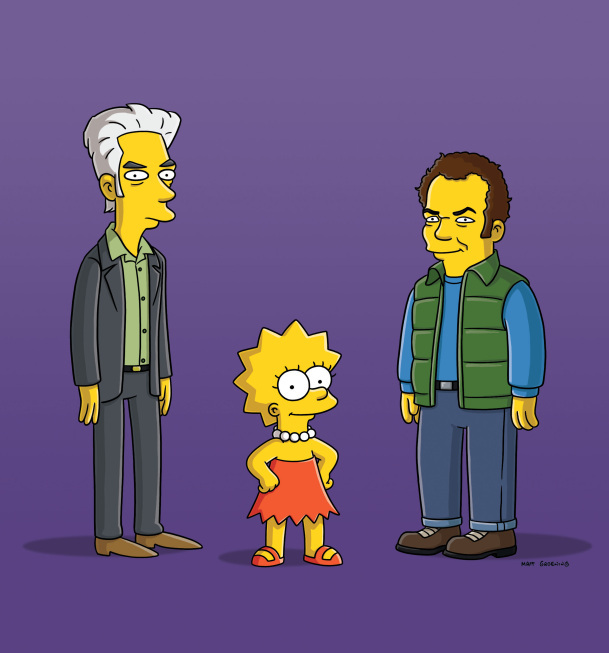 Some distributors find Skinner and Chalmers and want to buy Lisa's movie. Skinner negotiates the terms of the sale, which include access to the most exclusive VIP tent at the fest - which apparently belongs to "Scary Hobo Chili Chunks." Lisa's film is already getting attention, with a headline on the front page of Variety screaming "Sundance Loves Little Backstabber." The family is getting looks from people in the street. Homer said he didn't want to be famous for being mean, he wanted to be famous for catching Santa Claus. Lisa feels bad for what she did to the family. Jim Jarmusch comes up to her and says he can relate because his movies are also about "social misfits experiencing the dark side of the American dream," just like in his next movie, "Cheaper by the Dozen 3" - where everyone died, except for Steve Martin. He tells her the answer to her question of whether or not her family will forgive her is in a film - in this case, "Life Blows Chunks," a documentary by Nelson - with a little help from "Chalmskinn Productions." Poor Nelson's tralier is towed to an impound lot every night, his Mother is a thief. Jim Jarmusch keeps talking during the film. Nelson's life does blow chunks and his film is poignant and moving. I think the last shot was a take-off of the end of Truffaut's "400 Blows" (the wacky classes I took in college.) Nelson's the hot thing at Sundance now. Lisa thanks Jim for showing her that other people have bigger family problems than she does. He also wanted to show her how short-lived festival buzz really was. Lisa's film will be seen, "on select flights by Alsaka Airlines and its regional partners...okay, only its regional partners." He then bids her adieu in the fashion of the best indie films - fading out with a cool dissolve. Nelson is relishing his moment in the spotlight and Marge is happy the crowds are no longer jeering at them. Homer kind of misses the attention and Bart suggests that Lisa make another film, where they could act really bad. Marge said, "No more Simpsons movies, one was plenty." John C. Reilly wants to be in the Chalmskinn business and wants the lead in "Ghost Willie." Chalmers says "he seems a little needy" and Skinner says "pass." The episode received mixed reviews from critics and was named a "so-so episode" by Richard Keller of TV Squad. It was noted to be similar to a previous story, A Star Is Burns. Modified on July 16, 2017, at 01:58.